So far dooa has created 1 entries. While we might dream of a big bathroom in which we can splash around a double walk-in shower, triple basin and huge, freestanding tub, the reality is that many of have little more than a handkerchief-size space to play with. Fear not, though: There is a wealth of mini fixtures and fittings (teeny tubs and narrow basins, for starters), as well as loads of clever design tricks that can help maximize your bathroom’s footprint. White is always a winner in small spaces — be it on tubs, basins, floors or walls — but that doesn’t mean you have to enforce a total color ban. Far from it. In fact, playing with light and shade, color and contrast, will inject personality and style into what can be a sterile look. After all, doesn’t the saying go, “The best things come in small packages”? 1. Try a tiny tub. Some of today’s roll-top baths have been shrunk so you can squeeze one into even the tiniest bathroom. 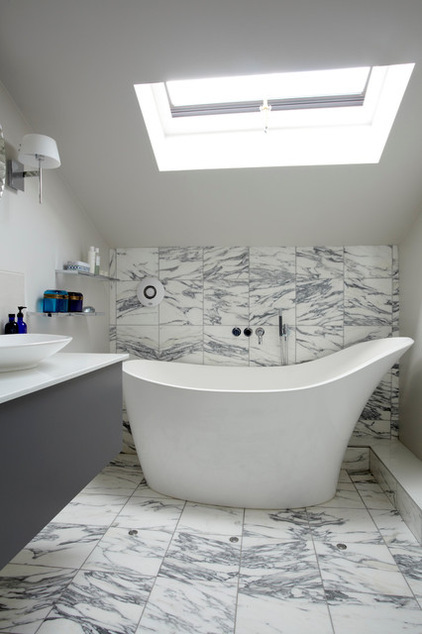 Make the best use of an awkwardly shaped room by locating your bath underneath the eaves. A teeny space also means you can splurge on luxe materials without breaking the bank. 2. Exploit corners. Corner shower enclosures are one of the best decorating tools for bathrooms that refuse to conform to standard dimensions. Wall-hung furniture is also a boon for creating the illusion of space, as your eye can see the floor right to the wall.